Now I know I’ve set this up as a purely book review blog, but I’ve decided to branch out a wee bit – variety being the spice of life and all that. So here it is, about once a fortnight/month or so, I’ll do a post on one of my other loves namely baking, crafting and writing. My aim is to keep these posts at least a little book related, but rest assured it will still be a blog mostly for book reviews. With all that in mind I bring you to my first post! It was the other half’s birthday last week and I decided to bake a cake. 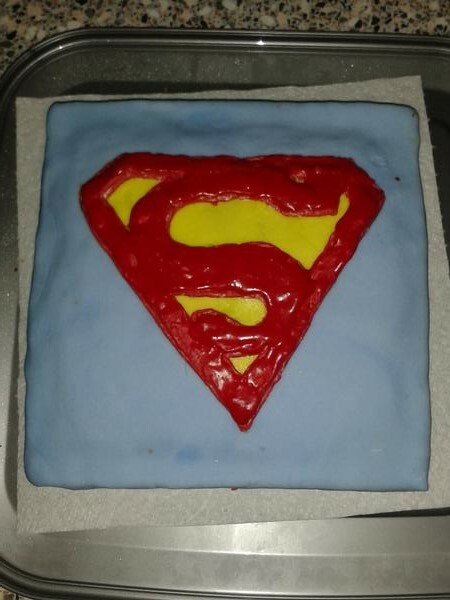 So far so good, I’ve baked cakes before, but in my infinite wisdom I decided I was going to do a superman cake. At this point I should probably mention I’ve not iced a cake in about 10 years since I iced one in Food tech. But! I think it turned out okay, I mean the colours are a little off and the buttercream was nothing short of a disaster, but it tasted fine and that’s the important part. Most families have various ways of baking a cake and mixing it together. I have friends who put milk into the mix and some who substitute for gluten free flour or want their cake to be eggless. If you have a method that works better for you, or you’re eyeing my recipe with a doubtful eye, then do what you know. Pre heat your oven to 180 degrees (I have an electric fan oven, temperature for other devices may vary). Crack eggs into a jug and beat them together. Pour a little bit of egg, and a little bit of (sieved) flour into the bowl with the butter and sugar. Mix together. Repeat till all the egg and flour are mixed in. Beat the mixture together. Seriously – stir like the wind! You should be left with a lovely cake batter. Pour the mix into the cake tin and pop it in the oven. Leave it for around 25-30 mins (or till golden brown on the top) to check it’s done stick a knife in the middle, if it comes out clean you’re good to go. Alternatively if you lightly press the centre it should bounce back up again when you release it. The annoying part was letting it cool because I was massively impatient and wanted to crack on with the icing. But if you don’t let it cool it can make icing … interesting. Oh! And don’t put your cake tin to wash either – you’ll see why in a bit. Anyhoo! So, the cake cooled and I had everything set up for icing. What did I do? I grabbed a pair of rubber/plastic gloves. If you’re using food colouring – especially lots of different ones – then protecting your hands from turning an array of different colours is pretty much a must. I learned this the hard way. Jam up the cake! Spread jam across the top and sides of the cake, this is to help the icing stick on. Dust a separate board and a rolling pin with icing sugar. Separate off a chunk of the ready to roll icing – this is really just a guess depending on the size of your cake, if you underestimate you can just ball it up, add some more and start over. Make a little well in the chunk of icing and pour some blue food colouring into it. Then it’s just a case of kneading the icing to blend the food colouring into it. A pause. As I hadn’t done this before I couldn’t work out why the colour didn’t get darker than shown in the final picture no matter how much food colouring was used. I later found out that mixing black food colouring into it would’ve made it darker, but as I’ve not tried this myself I’ve not added it to the instructions. Once the blue is fully mixed into the icing and you’re satisfied with the colour, then it’s time to start rolling! Roll out the icing – keep dusting the board with icing sugar and the rolling pin and your hands! I learned the hard way that when icing gets hot it sticks to EVERYTHING – use the cake tin to see if it’s big enough. Don’t press the tin down on the icing or anything, just kinda hold the tin over it and you should be able to gauge if it’s big enough. Use the rolling pin to help lift the blue sheet of icing up. Then drape it over the cake and smooth it down at the sides. The corners won’t sit flat, but that’s okay, just pinch them together. Take a sharp knife and heat the blade in hot water and then use that to remove the excess icing and neaten off the corners. Also cut off any excess. Now for the yellow icing. Same principle as before, take a (smaller) chunk of ready to roll icing, and knead in the yellow food colouring. Make sure to dust your board and rolling pin again. Plus don’t forget your hands. I have hands hotter than fire so I was stuck in a endless loop of half melted icing. 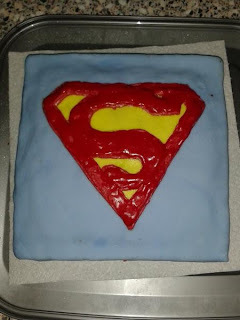 Roll out the yellow icing and then, using a sharp knife, do a freehand drawing of the superman symbol. It helps to have a picture of it to hand. Wet the edges of the symbol and then carefully position it on the cake and press down lightly to stick it on to the blue. Very, very gently, with the sharp knife, trace the outline of the famous ‘S’ onto the yellow icing. Now for the fun bit! I’m quite fond of making buttercream. Mostly because the way I do it requires a lot of taste testing. Put your butter in a bowl, and start adding icing sugar. Mix like crazy till you get a paste. Taste it – if it tastes right, you’re golden, if not add in more icing sugar. If it gets too stiff, you need a touch more butter. When the buttercream is right, mix in the red food colouring. Take your piping bag, chop a teeny bit off the end – you want to take off just enough so that the end of the nozzle just pokes through (the nozzle goes inside the bag – you do not want to know how long it took me to realise this). Fill the piping bag but no more than a third full with buttercream. If you, like me, have hands that are consistently hot I’d advise you run them under a cold tap for a long while. Seriously, I learned the hard way that buttercream starts to separate when it gets hot! Twist the top of the bag closed and then keep twisting until the buttercream starts coming out of the nozzle. Now, I hadn’t done this before and I just went straight to the cake, but those more careful than me might like to practise first on a piece of greaseproof paper. Pipe buttercream round the edge of the yellow symbol on the cake and then pipe the ‘S’ symbol (using the guidelines you drew with the knife earlier). There you have it, that’s how I made my Superman cake. I’m still learning, and I did learn valuable things about how nothing involved in the cake making process appreciates hot hands. Or heat. Unless it’s cooking time. I had the buttercream start the separate because my hands were too hot, and the icing melted into the gloves (which is an excellent reason to keep dusting your hands with icing sugar).